Screenwriter Tarell Alvin McCraney and writer-director Barry Jenkins, winners of Best Adapted Screenplay for Moonlight, pose in the pressroom during the 89th Annual Academy Awards at Hollywood & Highland Center on Feb. 26, 2017, in Hollywood, Calif.
With the Grammys behind us, it’s time to turn our collective attention to the Academy Awards. The Oscars are Sunday night, and just like Issa Rae, we’re “rooting for everybody black.” Here’s a breakdown of the black contenders for the gold in this year’s major categories. The news of Daniel Kaluuya’s nomination for his portrayal of Chris Washington in Get Out came as very little surprise to anyone who watched the movie, helping it to reach its $255 million box-office figure. The satire/horror film was both a critical and financial success, leading to speculation that he could walk away with Oscar gold. Along with Kaluuya, Denzel Washington, a perennial favorite, is helping to buoy the nominations for blacks this year in the Best Actor category. Washington portrays the titular legal persona, Roman J. Israel, with drama and humor. Could he win? Unfortunately, the Academy of Motion Picture Arts and Sciences doesn’t appreciate black people doing comedy. Or drama. Or anything. Plus, the movie was neither a critical darling nor a financial success. He should be happy just to be nominated. Analysis: Over the last decade, the award in this category has often gone to actors playing white dudes amid historical periods, like Daniel Day-Lewis (who is also nominated this year), for his roles in There Will Be Blood and Lincoln; Sean Penn in Milk; and Eddie Redmayne for his portrayal of Stephen Hawking in The Theory of Everything. The closest nonhistorical portrayals to Washington’s role among recent winners are probably Matthew McConaughey in Dallas Buyers Club and Jeff Bridges in Crazy Heart. 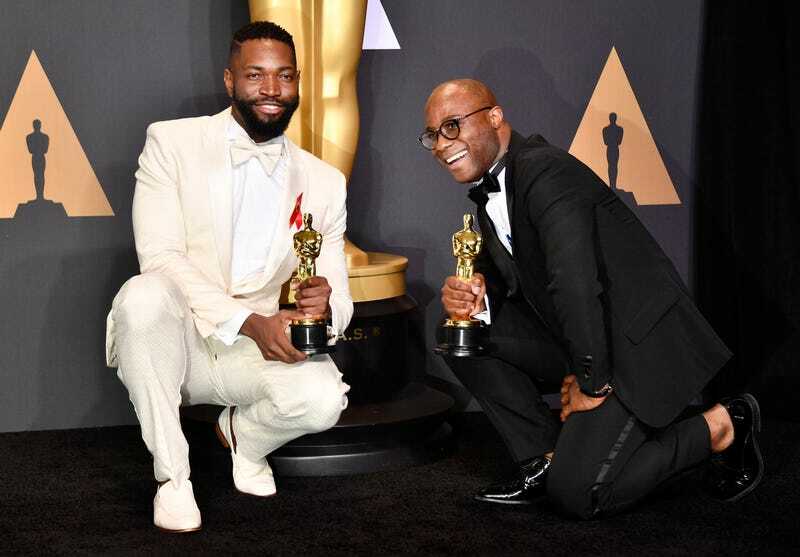 The precedent set by these two wins arguably gives Washington the better shot of the two black actors this year. But this means his performance will have to get more votes than two in movies that are both notably historical and dramatic: Gary Oldman in Darkest Hour and Daniel Day-Lewis in Phantom Thread. Note: There are no black nominees for best actress or best supporting actor this year. Octavia Spencer snagged a nomination for her role in The Shape of Water this year, making her the first black actress to be nominated two years in a row. She also now ties Viola Davis for Oscar nominations with three. Could she win? Spencer has a slight chance because of her pedigree and the fact that there is no clear-cut favorite in the category. Mary J. Blige surprised everyone with her understated portrayal in Mudbound and could be the first actress to win an award for a movie released on a streaming service (Netflix), which might undercut the boycott of that service by a previous black Academy Award winner, Mo’Nique. Analysis: Looking at history to predict the future in this category seems to give even odds to most of the actresses in the category this year. Some might consider Spencer’s recent win for Hidden Figures to be a potential handicap, however, considering that the academy might not want to hand her the award after a previous win and back-to-back nominations. Also, Spencer gets her nomination from a science fiction movie, a genre mostly honored at the Oscars in more technical categories, like sound editing and visual effects. Jordan Peele, for Get Out, represents the only black entry among this year’s Best Director nominees. Could he win? Looking at the past decade, Peele’s best hope for a win lies in the winning precedent of drama and grit, set by films like Slumdog Millionaire, The Hurt Locker and Birdman, as opposed to the cinematic eye candy displayed by films like Gravity and The Revenant. But in the year of #MeToo, Peele’s chances may also be undercut by Greta Gerwig, the only female nominee in the category, nominated for Lady Bird. Get Out, represented in five categories this year, has a tough run to complete in order to pick up the win for Best Picture. Could he win? First off, it’s an off year for #OscarsSoWhite guilt. That is to say, last year’s win by Moonlight in the category might offer the academy slight relief from the social pressure to take Get Out so seriously. Also, Get Out is fighting an uphill battle against a grouping of four historical films out of the nine Best Picture nominees this year: Darkest Hour, Dunkirk (both World War II films), Phantom Thread and The Post. Historical films account for about half the winners over the last decade in this category. One factor that gives some hope is that many times, the Best Director and Best Picture categories are closely related; about half the time, the film that wins one award wins both. With an academy that’s over 90 percent white and over 70 percent male, winning it over seems to be a daunting task for our nominees in a lot of these categories. It’s not surprising to see wins that heavily favor white, male-centric nominees even in categories that aren’t gender-specific—thus #OscarsSoWhite. The Oscars air on March 4, should you choose to watch, with black fist held high, rooting for black excellence to shine. Jeremy is a techie, cinephile and general blerd at heart who spends his time amassing useless trivia. He's a cohost on The Man Brain Podcast. Why Aren’t There More Black WWE Stars?